It is not given to all of us to have a grandmother photographed for around 500 different postcards, many of them labelled ‘An Official British Beauty’: I think it must have had something to do with World War One. My grandmother, on my mother’s side, was Dame Gladys Cooper, who started out as a chorus girl at the Gaiety, went on to become the first woman to run a commercial theatre (the Playhouse) in the West End, spent twenty years under contract to MGM (Rebecca, Now Voyager, The Song of Bernadette) and finished up as Mrs Higgins, Rex Harrison’s mother, in the movie of My Fair Lady. But she was also, perhaps because of her ‘official beauty’ status, an early sitter for several great photographers, among them Dorothy Wilding and Cecil Beaton (both of them represented in the Gallery’s collection, with Beaton’s studies running from the 1920s well into the mid-1960s with the My Fair Lady shots). 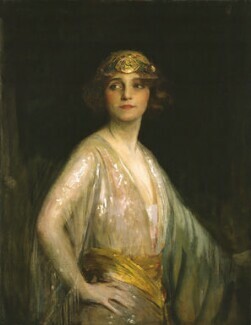 She sat as well for upwards of forty-five portrait painters, much of whose work remains in private collections, though a classic John Collier can be seen in the Milne Room of the Garrick Club, and the Gallery has a Charles Buchel (illustrated) which I love for its Art Deco quality, yet another of the visual and theatrical fashions which Gladys outlived in a long and triumphant career. ‘Gladys Cooper 1888–1971’ says the sign on the wooden bench by the Thames at Henley, her only other memorial unless of course you count the movies. At nearly eighty-three years it was a long life, but even so not, I think, long enough for Gladys herself: or for me. Sheridan Morley is drama critic of the Daily Express and presents Melodies for You every Sunday on BBC Radio 2.